With my first day behind me, I have high expectations for the rest of my time in Guatemala. I’m up early and departing Antigua for a little known Mayan site called Iximche before visiting market day at Chichicastenango. If you haven’t heard of these ruins don’t be surprised – there are no large impressive structures to attract tourists here like Chichen Itza or Tikal. The majority of the visitors here are Mayans and citizens of Guatemala. I did find it utterly hilarious to learn that after U.S. president George W. Bush visited in 2007 that Mayan priests felt the need to purify the area and remove the bad spirits he brought. 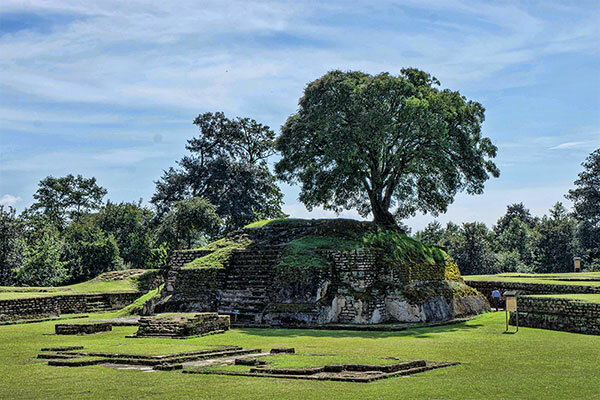 Initially I wasn’t too impressed with Iximche – having been to so many other ruins it lacked a wow factor. That all changed however, when our group reached the back of the site. We walked right into a Mayan shaman performing a ritual right in front of us! Behind the shaman and his subject stands a tall altar that had been decorated with yellow flowers. A sugary substance has a swarm of bees loudly buzzing around in a frenzy. The air is smokey, and a fire crackles as the shaman dances and chants loudly. Holding a chicken in one hand and a bottle in the other, he pours liquor onto the fire and continues chanting. Our group sits in silence, our eyes glued to the scene not wanting to miss what we know inevitably comes next. The chicken is sacrificed, its blood is dripped into the fire and onto the platform they stand on. And then smeared onto the man the shaman performs for. The chanting continues. What had started as a rather forgettable experience had quickly turned into one of the most memorable I’ve had on my entire Central American journey. Known to travelers as one of Guatemala’s can’t miss activities we next made our way to the Sunday market in the small town of Chichicastenango. The “Chi Chi” market, open on Thursdays and Sundays is the largest open air market in the country, possibly also the most diverse and colorful in all of Central America. The street are lined with stalls filled with traditional Mayan crafts like hand-woven blankets and wood carvings. The locals aren’t afraid to be push what they sell aggressively towards anyone that appears to be a tourist. It didn’t take long before one of our group, an older Israeli man traveling with his wife and two sons, had been zeroed in on as a hot target. Five Mayan women selling handmade textiles surrounded him and began shouting they each had the best price (pictured at the top of the post). They weren’t to be deterred by his disinterest or polite decline to buy and continued to follow him down the street for twenty or so minutes. The impact of frequent visiting tourists was beginning to shine bright.. although a public place, the women would watch close and immediately cover their faces before I could take a photo, even if they weren’t the subject of it. It wasn’t because of a Mayan belief or tradition, it was simply to demand money. Personally I dislike the idea, but I caved in and gave one of the women pestering my Israeli companion a couple dollars to pose for me. The market had a huge variety of edibles and goods of all kinds for sale. It was quite fun to wander through the maze of stalls and shops waiting for something to catch the attention of my senses, and never took long. Want to see more photos from the market? View the Chichicastenango Photo Gallery Here. 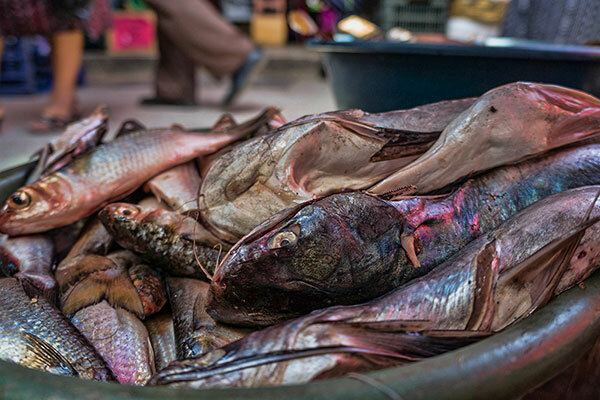 I would really enjoy the walk to the local food market – have a little chat with sellers, buy some herbs and spices and try the local fish :).